" . . . and she's such a capital thing for catching mice — oh, I beg your pardon!" cried Alice again, for this time the Mouse was bristling all over, and she felt certain it must really be offended. "We won't talk about her any more, if you'd rather not." Alice, unaccustomed to speaking with mice, underestimates the Mouse's sensitivity to discussing cats. The Mouse's denial of Alice's "we" and his invocation of family aligns him with the adults in Alice's reality who likely try to correct any of her childish faux pas. Alice's lack of realization about the danger of cats to the Mouse also shows her continuing belief in static identity. Harry Levin points out that "her shrinkages have taught her to look at matters from the other side, from the animals' vantage point," but only with a concern for maintaining proper decorum (184). Alice glosses over the more fearful aspect of her newfound smallness: not that she offends mice without meaning to, but that she could be eaten like the mice. 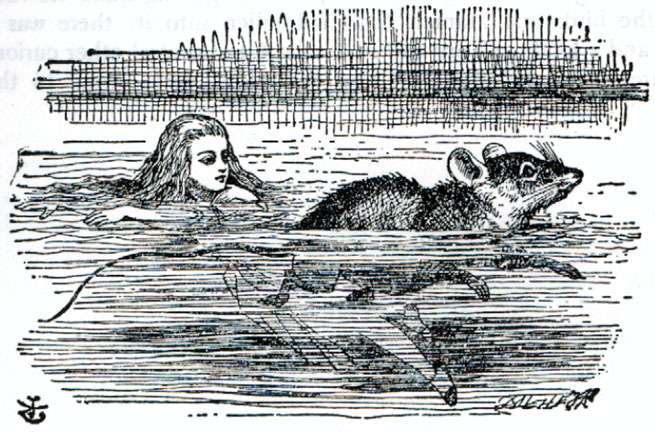 Alice does not recognize that her beloved cat Dinah would likely not differentiate between her and a regular mouse; she still conceives of herself as the child that existed outside of Wonderland. Again, Wonderland's boundary-crossing changes jeopardize Alice's predefined sense of self without her fully knowing it. "Mine is a long and sad tale!" said the Mouse, turning to Alice and sighing.